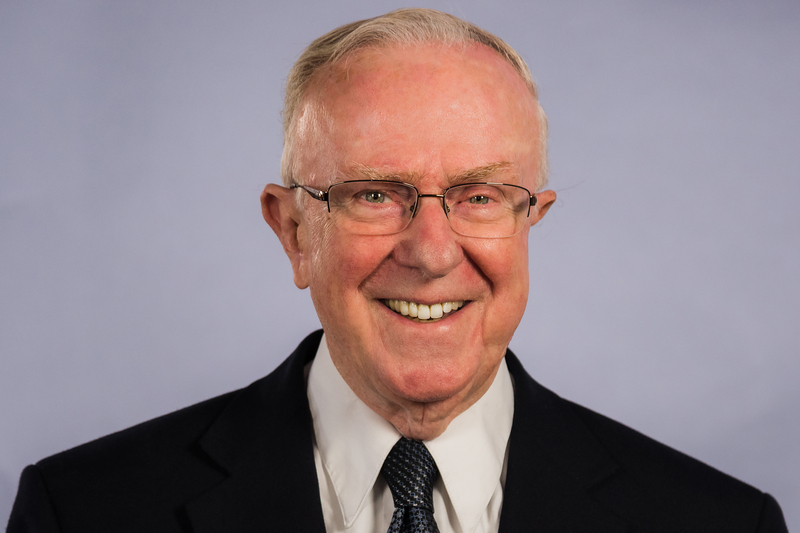 Throughout most of his life Deacon Leo McBlain has relied on the direction of the Holy Spirit and his wife, Barbara, often almost seeming to speak with the same voice. He recalls buying a house and moving his young family to Cherry Hill, only to learn that he would have to move again, to New England, because of his job. And soon after that, sitting in a business meeting and learning plans had changed, and his division would be relocating not to Connecticut as previously announced — but to Mount Laurel, N.J.
Everyone else in the room was dismayed, but Deacon McBlain was so elated he left work to go home to tell his wife. Instead of breaking out the champagne, she showed him an article from that day’s newspaper: the Camden Diocese was reinstituting the permanent diaconate. In no time, he was in formation. On Oct. 4, 1976, after three years of preparation, McBlain and 26 other men presented themselves to Bishop George H. Guilfoyle and became the first permanent deacons to serve in the Diocese of Camden. Deacon Leo McBlain chats with Father Sanjai Devis. Deacon McBlain’s years of active ministry have included parish work and administrative positions, both on the diocesan and national level. For years he was director of the permanent diaconate for the diocese. In recent years he’s served as director of personnel — the men already ordained — while Deacon Michael J. Carter has been director of formation. Now 83, Deacon McBlain has stepped away from the director’s role, largely to spend more time with his daughter Nancy and her three children. “When I was in formation, it was drilled into us over and over again. Our priorities were God, family, diaconate, in that order,” he said. He adds that priorities shift and juggle for position, sometimes almost by the hour, it seems. “Now is less time for office work, more time being Grandpop,” he said. Including his secular employments, Deacon McBlain has had several retirements. Catholics throughout South Jersey who have seen Deacon McBlain on the altar at his home parish, Christ Our Light in Cherry Hill, or other churches might be surprised to see a photo of him standing on Wall Street that accompanied a 1997 trade journal article about him discussing the Securities and Exchange Commission. At that time the clergyman was chairman of the Financial Information Forum, an information clearing house for the market data industry. “That sounds simple to say,” he said, but it takes in a man’s understanding of charity, wisdom, suffering and much else. Suffering is a subject Deacon McBlain knows about, having experienced the death of three of his seven children. Still, proclaiming the Gospel in a broken world while dealing with your own trials is, in a word, “hard,” Deacon McBlain said. Furthermore, today’s deacons face challenges no one envisioned when he was ordained 42 years ago. Deacon McBlain said Barbara, his wife, taught him how to listen, and it made him a better person. He recalled a dream he’d had. The two of them were on a ship, reassuring a group of worried and upset passengers. There was an announcement that it was time for anyone not taking the journey to leave the ship, and Deacon McBlain knew he had to go, but he couldn’t find his wife. And that’s when he woke up. When Deacon McBlain, puzzled, told his wife about it, she told him its meaning: “You’re going to have to carry on without me,” she said. She’d been battling leukemia. Her desire was to die in her sleep, in her own bed, with him beside her, and she did on Nov. 29, 2016. They had been married 50 years. 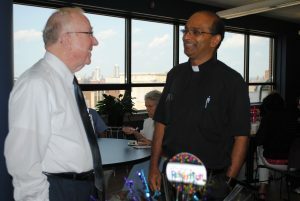 Although Deacon McBlain is leaving the director’s position in the diocese, he’ll continue to help out at the parish.